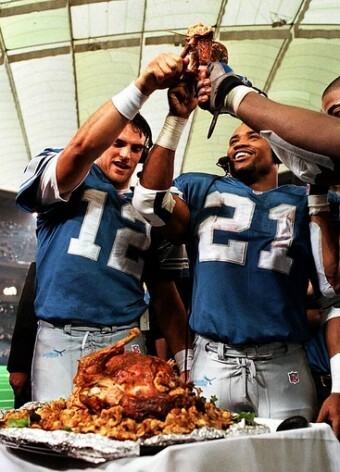 Today I found out how the tradition of the Detroit Lions playing on Thanksgiving got started. In 1934, radio executive G.A. Richards bought the Portsmouth, Ohio Spartans NFL team, moved them to Detroit, and renamed them the Lions. Unfortunately for him, nobody in Detroit cared much for watching the Lions. Despite winning all their games but one before Thanksgiving, having several stars of the day, and one super star in Earl “Dutch” Clark, the average turn out for each game was only around 12,000 people. At the time, it was fairly traditional for various football programs in high schools and colleges to hold particularly significant games on Thanksgiving. So Richards decided to try to bring this same tradition to the NFL, convincing the NFL to allow the Lions and the defending World Champion Chicago Bears to play for the Western Division championship on Thanksgiving. Richards then used his considerable influence in radio to convince NBC that they should broadcast this game on the radio all across the United States, something that had never been done before for an NFL game. The game ended up being a huge success, being played at the University of Detroit Stadium in front of a sold out crowd of 26,000 fans and broadcast across the nation on over 94 different radio stations. In the end, the Bears won 19-16, but the game was such a success, as far as ratings and fan turn-out went, that Richards fought to be allowed to continue having the Lions play on Thanksgiving going forward and to continue to have that games broadcast out on the radio nationwide. Since that first game in 1934, 70 games have been played by the Lions on Thanksgiving as of today (with no games during a five year gap for WWII). The Lions currently hold a record of 33-35-2 in those games. The first televised Thanksgiving Day game was in 1956 against the Green Bay Packers with the Lions losing 24-20. In order to appease fans of other teams who also wanted their favorite team to take part in Thanksgiving NFL games, in 2006, the NFL instituted a third game, on top of the Detroit Lions and Dallas Cowboy traditional games. This third game has no fixed teams, as in the previous two. Football was actually traditionally played on Thanksgiving long before the NFL ever existed. As early as 1902 it was common for such leagues as the National Football League (not to be confused with our current National Football League) to use Thanksgiving as their championship game day. Interestingly, this league was funded by Major League Baseball. Another league, called the Ohio League, liked to match their best teams together for Thanksgiving games. Many other such leagues also did the same thing. As noted, it was also common among many colleges and high schools to hold annual Thanksgiving football games.